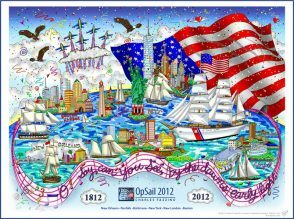 NEW YORK, NY — Famous3-D Pop Artist Charles Fazzino has created the Official Commemorative artwork, including a Limited-edition Poster and Commemorative Tee-shirt for OpSail 2012 — a partnership between Operation Sail Inc. and the U.S. Navy. OpSail 2012 is commemorating the Bicentennial of the War of 1812 and the writing of The Star-Spangled Banner with a parade of tall ships and series of week-long events at six American ports in Spring/Summer 2012. The OpSail 2012 events include a parade of these international tall ships and military ships into six historic ports — New Orleans, Norfolk, Baltimore, Boston, New YorkCity and New London. The events extend from April 17 thru July 8. U.S Navy ships, international warships, and the famous Blue Angels Flight Demonstration Squadron will also participate in OpSail 2012. States, municipalities and civic organizations have formed host committees to organize the week-long events in each port in concert with OpSail executives and Navy officials. All of the ships will be open for public visiting free of charge, and citizens will have the opportunity of interacting with talented young sailors from around the world. 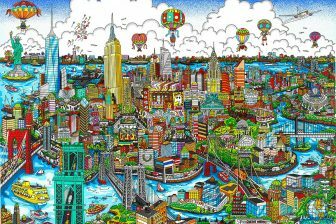 Charles Fazzino — one of the most popular artists in the world — is an officially licensed artist of Major League Baseball and the 2012 MLB All-Star Game, the USOC and 2012 US Olympic Team, and the National Football League and Super Bowl XLVII. Charles Fazzino has also created official artwork for high profile events, including: Fort Lauderdale Centennial, NASCAR Sprint Cup series, NHL All-Star Game, Olympic Games, Belmont Stakes, Daytona 500, Indy 500, Andy Roddick Charity Gala, U.S. Tennis Foundation, CMA Awards, Grammy Awards, NBC’s “Today” Summer Concert Series, Rosie O’Donnell’s For All Kids Foundation and the President William J. Clinton Presidential Foundation, among many others. 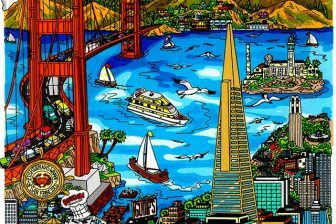 Charles Fazzino’s artwork, including his Commemorative Super Bowl XVI art collection, can be viewed at: www.fazzino.com. Operation Sail, Inc. is a non-profit organization established in 1961 with the endorsement of President John F. Kennedy. Backed by a Joint Congressional Resolution, its mission is to advance sail training and promote goodwill among nations. As the Congressionally chartered non-profit producer of tall ship events, OpSail has staged spectacles for five previous American milestone events such as the 1964 World’s Fair, the 1976 bicentennial of American independence, the 1986 State of Liberty centennial, the 1992 Columbus Quincentennial, and the Millennium in 2000. The Erlick Group is a leading NYC-based entertainment sponsorship agency founded in 1992 by Jim Erlick. 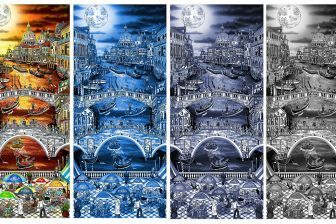 The Charles Fazzino Official Art Program for OpSail 2012 is created in cooperation with The Erlick Group. For additional information about the Erlick Group, please call: 212-418-7372 or visit: www.erlickgroup.com. Director of Communications, Operation Sail Inc.